A few years ago, I took a little job accompanying for a Suzuki strings studio. It’s challenging, but learning so many new pieces, and polishing my accompanying skills is so much fun. So this week, as I’ve been practicing for hours each day in preparation for the big recital, I remembered my own accompanists from years ago. In college, I never truly appreciated how much an accompanist does. Being a typical singer, I would forget to count half way through the long notes, and fudge a bit (for breath-sake) on the odd rhythms. Tricky entrances were my worst fear. I also chose the songs with the most difficult accompaniment because they were the most beautiful. And somehow, they kept up with me and never complained. 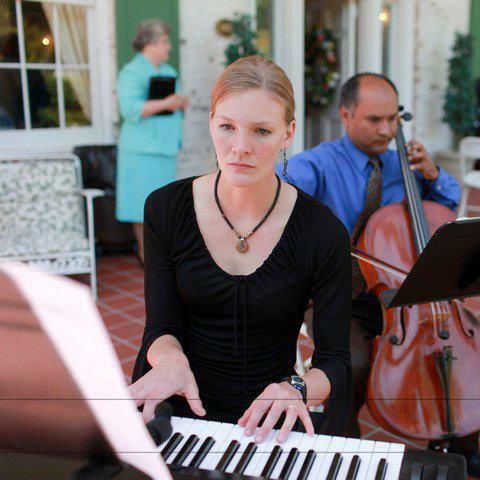 Little did I realize the possible headaches and eye rolls that my poor accompanists held back for my sake. And now that I am the one sitting at the piano most of the time, I have learned a few things. 1) Turning pages is hard and sometimes impossible if you don’t have a nifty assistant beside you. Although frowned upon, I use the spread out copies method for the most difficult, long pieces. I’ve also learned the folded corners trick and the memorize-the-first-measure-of-the-next-page trick. Who would’ve imagined that practicing flawless page turns sometimes takes more practice than the actual song? 2) A good accompanist must be all-knowing. My part, your part, everybody’s part and be prepared for them to mess up. 3) When they do mess up (not if), you must use mind-reading techniques to decide how they’re going to react before they do it. 4) You must learn the piece at every speed imaginable. Child A studied diligently and learned the piece at the perfect speed, Child B takes it a bit too slow because the fingerings are tricky, and Child C thinks that this is a roller derby (fast, lightening speed, and haltingly slow). 5) You Tube can be your best friend. Are you bad at multi-tasking on those more tricky pieces and humming over your piano part doesn’t work? I am. That’s why I type it into You Tube and listen to 3 people butcher it before I find a decent recording. 6) Trying to convince a parent that his/her child is not perfect is not a good idea. I have one parent in particular, that each year, while I’m accompanying for her child, thinks that every mistake is mine. Not a big deal until she refuses to pay me because there is no way it’s because her daughter hasn’t learned her piece well enough. Again, if I could mind-read her child, this would be no problem, but alas, it is not. 7) If you do make a mistake, everyone will notice and likely remember. If you don’t mess up, few will notice that you played at all. It makes me laugh, but it’s completely true. This is my heartfelt thank you to my accompanists (Tim, Tim, and Roy) for not killing me during college. You really showed me the grace of God. This is a song I wrote about 3 years ago. I was on a long road trip on the back of my husband’s motorcycle. We were returning from seeing some people who we love very much, and were really having a hard time with life. I started singing and forming the phrases and tried to memorize every phrase. So by the time we finished our road trip, I had the whole song memorized and ready to write down. It’s mostly about how God takes the bad and uses it as a witness to His good. Enjoy this little rough cut. The Musical Home is powered by	WordPress 4.6.14 and delivered to you in 0.294 seconds using 41 queries.